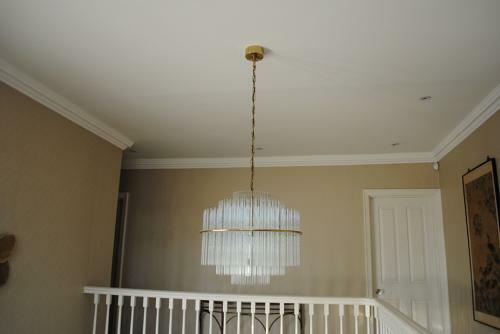 Gaetano Sciolari chandelier from the late 1960`s, Italy. Chromed metal, steel disk with polished brass trim. Rings of glass rods of differing lengths, giving a tiered effect. 9 bulb holders and over 200 glass rods. Original Sciolari label in the brass ceiling rose. Longest glass rod is 50 cm. Width of steel disk 50 cm. Max length with existing chain 130 cm (could be shortened or indeed lengthened).